As a bit of a note, that’s the big change that I’ve noticed here. My lifestyle is built around doing a great many things, and meeting with friends over food and/or drinks. This means this week has put a bit of a damper on my lifestyle. Actually, a lot of one. But I’m not sure it really matters anyway, because I’ve found that I’m too exhausted and continuously hungry to really enjoy going out. In fact, I’ve been waking up in the mornings actually faint. This morning I barely made it to my church service (I sing in the choir), and then barely made it through. I felt horrible the entire time, like I was going to pass out. So… yah. And this has affected my mood too. I’m really really grumpy and cranky. OK, yes, many of you might make the joke of, “How is this different than usual.” No, really, it’s different. It’s like all emotions are turned up to 12 when the dial only goes to 10. They’re completely out of control. And I feel really guilty about that too. And when they’re not at 12, they’re completely dead. It’s fantastic, let me tell you. 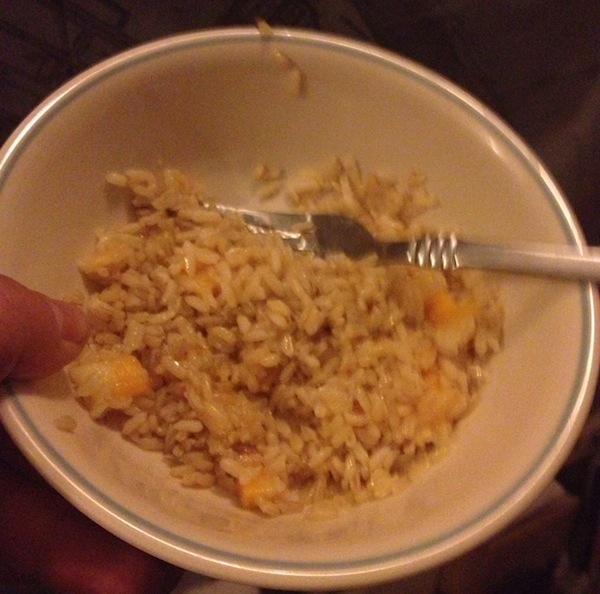 Friday evening, I needed a snack, so I got out some of the rice, put butter in it, and added some cheese for a small pre-bed snack to try to abate the hunger. Yesterday morning, realizing I was faint from hunger, I decided to pack in some extra protein. 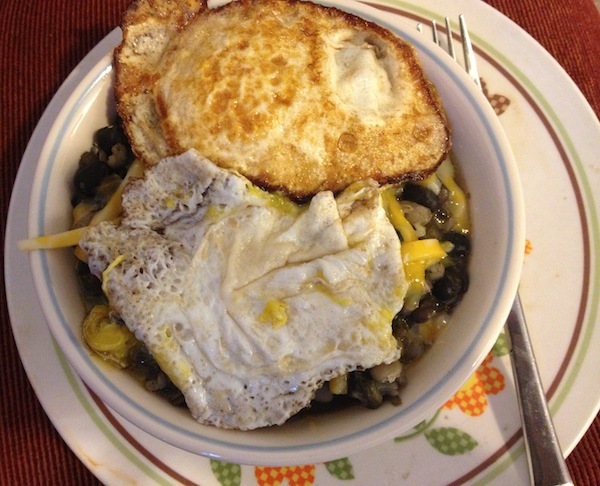 So I mixed the beans together (black beans, navy beans, and lentils) with hominy, sliced a bit of cheese on top of that mix, and put two eggs over easy over top. This is something inspired by a Cuban restaurant I went to in Philly. And oh my god did it taste good. Probably because I really really really needed what was in it. I managed to get that done before rehearsal (which meant getting up early, of course). Then, after rehearsal, I decided to really prep the beans into something I could continue to use later this week. I cooked up a giant pot of bean stew, basically. 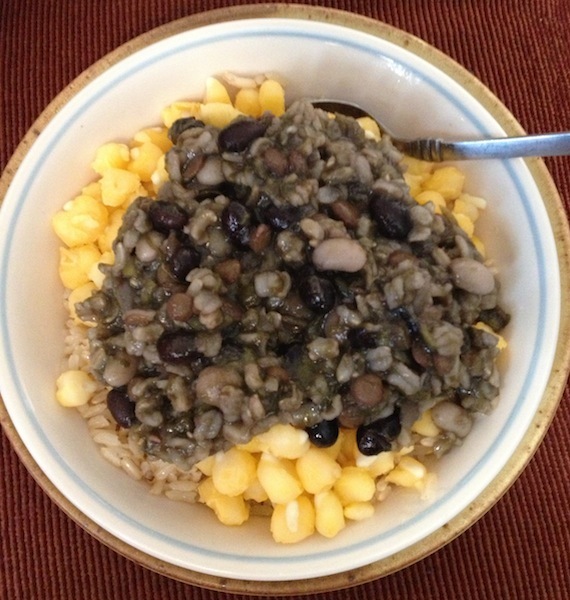 I put in the same black beans, navy beans, and lentils, but also added green beans and spinach, and some rice. The end result was about 10 cups of bean stew, which I’ve been using as a base for meals since. 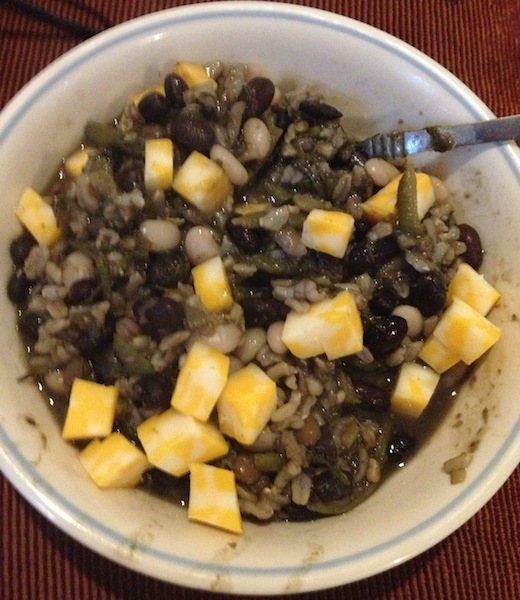 The first one being just that bean stew with some cheese cubed into it (which melted as I ate it). This was tasty enough that I had two bowls last night before heading to Princess Ida. This morning, realizing yesterday’s morning’s meal was so good, I did a small reprise. This time I just used the bean stew as the mix, but it was otherwise the same. When I got back from church, I was planning to get a bunch of stuff done around the house this afternoon, including: finally getting the mint invasion out of my front garden so that I can have tulips in the spring, bringing in all of the herbs from outside so that I can continue to grow them inside for the winter, dealing with my mess of clothes that are everywhere upstairs after three trips in two months, plus exchanging the summer and winter clothes out of the trunk, and practicing my music (audition on Tuesday!) What I actually did: sat on the couch feeling really weak, did get the mint dealt with and brought the herbs in, sat more on the couch feeling weak, prepped some food to eat, had a nervous breakdown at poor Derrick, and finally took a three hour hot bath. Yah. But the food I prepped then, more of the bean stew, this time on top of rice and the rest of the hominy. It was pretty good. But then, I’m beginning to be convinced that hominy makes everything better. 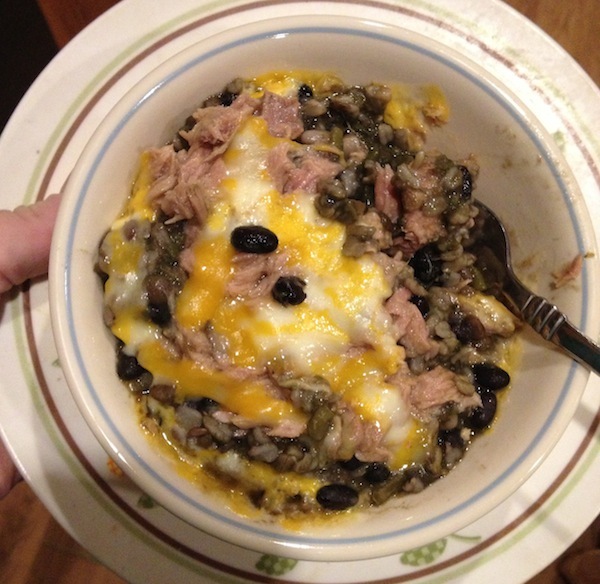 Lastly, this evening’s meal was the bean stew mixed with tuna and melted cheese. It was all I could do to motivate myself to make more food. Oh, and roughly 42 ounces of water. I think the three hour hot bath dehydrated me. As a last note, a lot of people have tried to offer me free food, or suggest I go looking in places that are now free. To my mind, this defeats the point — I’m privileged, and I have a lot of privileged friends, and next week I won’t need the freebies, so I’m given a lot more opportunity than most on food stamps would have. So far, and this is only day 4, I’ve been offered free beer (and quite a bit of it), sushi, an entire lunch or two, cake, pastries, juice, and cookies. I really appreciate the thought from my friends, I do, but I need to stick to my guns and only use what I bought for this week or farmed from my garden. Otherwise, I’ll go down a very slippery slope into … well, there’d be no sacrifice for me this week. One caveat, though… my work provides free bagels and donuts once a week, and I do have that audition on Tuesday. I am going to partake of work’s free bagels and donuts on Tuesday so that I have more energy for the audition. At least with work, I can justify this as it’s part of my payment? Or something? Please let me have this one thing, I swear I’m not cheating otherwise!! You didn’t seem cranky when I saw you Friday night. Also, just wondering if you may be losing weight from this experiment? I’m able to put on a good face in public, plus the cranky was really bad on Sunday. I don’t know about the losing weight part. Good job, Gwen. 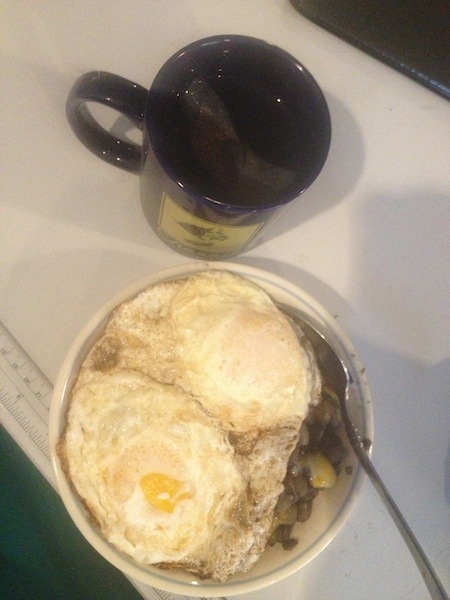 I am impressed that you eat basically the same food every meals and feel hungry a lot, but still stick to your plan. I don’t think taking the bagels/donuts from work is cheating! When I worked at a daycare, I was really really broke. Like ended up on foodstamps broke. But in the early stages when I was too proud to apply, the food at the daycare helped so much. They encouraged all of the teachers to eat with the children, maybe to encourage proper table manners or something, but I know without those free lunches, my days would have been completely miserable. I admire this challenge! (Though having been on the receiving end of foodstamps twice in my life, have no desire to replicate it.) Good luck!